The trip to Calabrese Farms in Southwick, MA on Friday afternoon resulted in purchasing local, fresh, juicy, fragrant Peaches! If you enjoy making Freezer Jam, as I do, it is time to get moving when the fruit is ripe! Yesterday a batch of Peach Freezer Jam was prepared. In a couple of hours it will be stored in our large freezer downstairs. 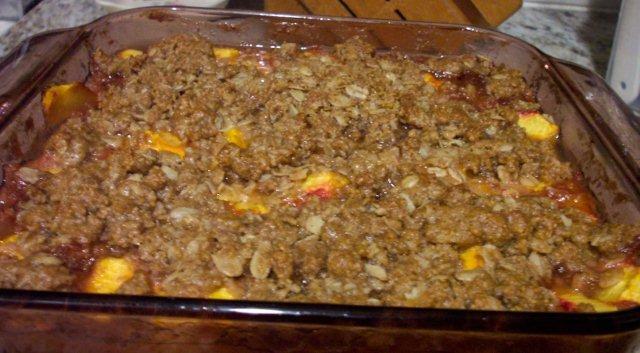 The afternoon began with preparing Freezer Jam and ended with one very tasty dessert - Peachy Craisin Crisp. Yummy! It has become a tradition for me to bake this scrumptious dessert after making the jam. I'm sure it's due to the fact that not only are the juicy 6 - 7 Peaches in my fridge, but my kitchen counters and stove contain all of the necessary utensils. My rose colored Pyrex container can be located quickly. It's 8" x 8" size is perfect to use. The combination of Peaches and of dried Cranberries is scrumptious in this dessert with an oat topping. Spray PAM in glass baking dish. Place sliced Peaches in baking dish. Sprinkle on Craisins and mix. In small bowl combine remaining ingredients thoroughly. Sprinkle over Peaches. Bake 45 minutes or until Peaches are tender. Serve warm or cold topped with a scoop of vanilla ice cream. After cool, cover and refrigerate any leftovers. This is a great dessert filled with slices of fresh fruit! An added plus is that there is no pie crust to roll out on a warm summer day if this delicious fresh dessert is prepared. Sweet! Do you bake using fresh peaches? 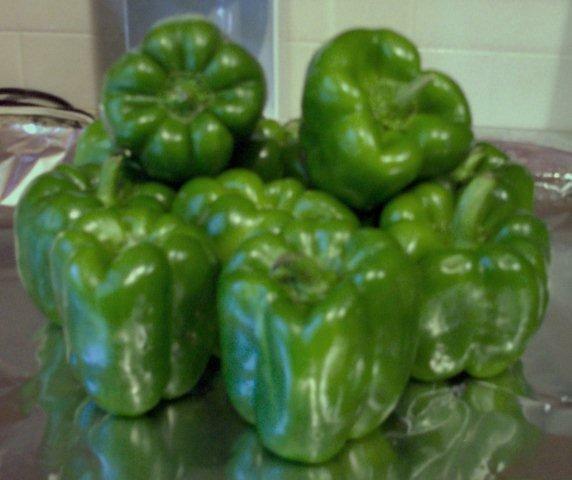 After these 10 large green peppers were placed on my countertop the song/book "Five Little Pumpkins" quickly came to mind. It's the song that young children learn during the month of October. For younger tots there is even a board book or two containing the cute verse and illustrations with bright colors depicting the adventure of the bright orange pumpkins. However, the bright green peppers on my counter would take the journey into my freezer. During the month of August the local roadside stands sell and home gardeners grow nutritious, delicious green peppers. It is at this time period each summer I purchase, prepare and then freeze these veggies after they have been cut into strips. 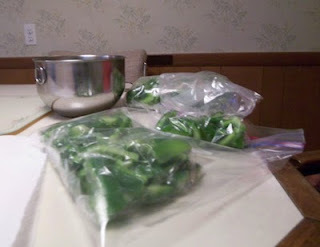 Later in the year and into 2011 whenever I want to add green peppers while preparing a main dish, I'll reach into my freezer and voila, they will be ready to use. Sweet! The process I follow is easy. The peppers are washed in cold water and dried. Then, each pepper is cut into strips. I place a handful of the cut strips into sandwich bags (that fold). Then, each sandwich bag is closed, rolled and placed into a gallon sized Ziploc Freezer Bag. For me, about 7-8 sandwich bags of pepper strips fit in one Ziploc Bag. After labeling & dating the Ziploc Bags, they are stored in my freezer. These veggies are now ready to be added to my slow cooker or into any main dish that I will be preparing when the local fresh green peppers are not in season any longer. In the winter there is no walking past imported green peppers in my grocery store - wishing for our local summer crop. They are waiting in my freezer! Do you freeze pepper strips when the green peppers are in season? Do you like to stash veggies away for the colder months? Boil 1 Cup cold water. Place contents of 1 small pkg. flavored gelatin in a medium bowl. 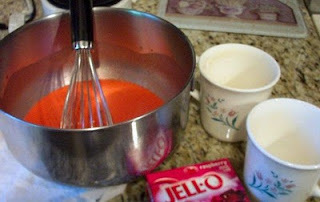 Pour in hot water and stir to dissolve gelatin. Add 1 Cup Vanilla ice Cream. Whisk or stir well until ice cream melts. Pour into 2 serving dishes/mugs. Earlier this afternoon I used one small pkg. Raspberry flavored Jello gelatin and 1 Cup of Black Raspberry ice cream. Sweet! Sometimes, I use Strawberry flavored Jello, Strawberry ice cream and a few defrosted Strawberries. Do you have a favorite quick dessert you make during the summer? 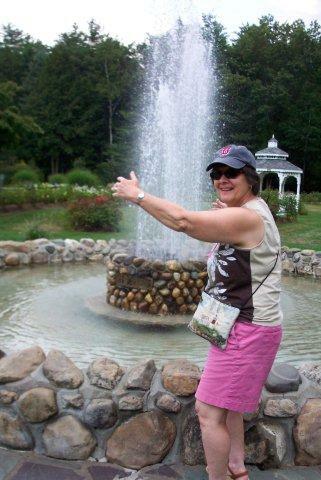 Do you have a favorite park you visit? and also from the soil rising upward! Usually food is my topic of choice, but during this past week I have been enticed with the plants growing around our home. Summer in the Pioneer Valley is so colorful - filled with annuals and perennials. The local Strawberry and the local Blueberry crops have been sweet and also abundant. In my last post I mentioned that while growing up my family always had two large gardens filled with veggies. My Hubby & I continued my tradition. We lived in an apartment in a suburb and had a great landlord! He knew that we were dreaming of a garden ... someday. Well, his thought process was why wait? Part of his side lawn was plowed, so we could have our wish! Now, that was totally cool! We grew corn, cantaloupes, squash and all of the customary veggies. I canned and froze veggies to my heart's content! After we purchased our house and moved into our home, my DH and I were raising a family and gardening was in the past. However, there was always a place for flowers and flower boxes. 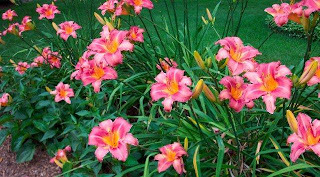 Flowers are just gorgeous! Earlier this summer our Salmon colored Daylilies blossomed for a month. 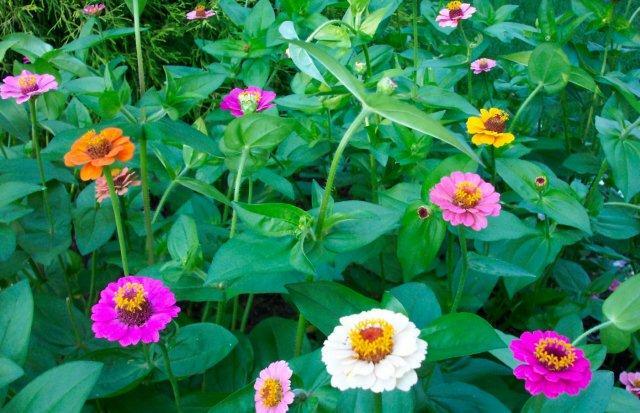 Last year after having a difficult time locating Zinnia plants that would grow to a certain height, I decided to plant Zinnia seeds. Until a hard autumn frost arrived, the vibrant colorful display of blossoms were so pretty! One of our planters contained deep purple New Wave Petunias. 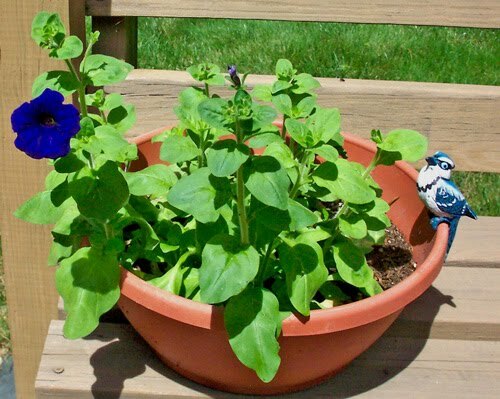 Throughout the growing season, I saved the extremely delicate small black Petunia seeds and also many Zinnia seeds. This past week has been sunny and bright. 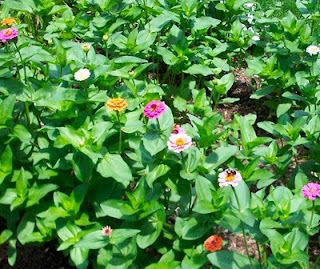 The seeds that I saved and planted in early June (from last year's abundant crop) is now blossoming! 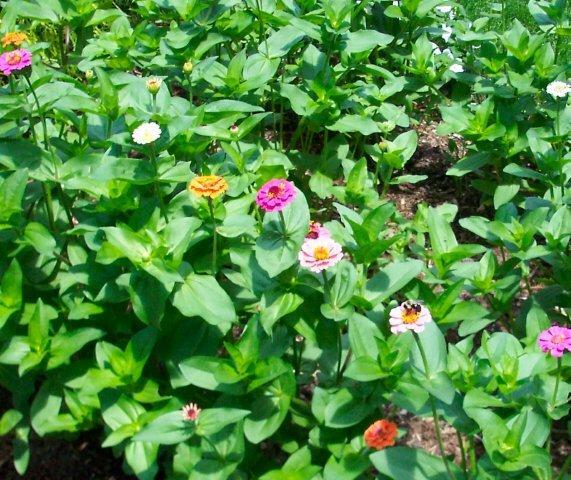 A few Zinnias and one Petunia! There are so many buds visible! How cool is that?!? Yes, I will be saving seeds, again, to plant next year! I will plant the seeds 2 weeks earlier. Do you save flower seeds to plant the following growing season? We are enjoying their beauty!